5 - 4,4,5.......Vello von Fürstenfeld. 5 - 4,5..........Kira vom Romberg. Briska's BriBinna passed the Swedish Körung, became Swedish Show Champion and is PHTVL/PHPV free. 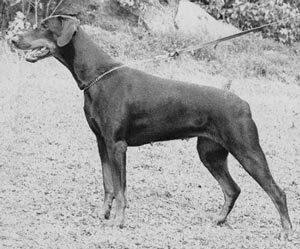 BriBinna's sire, Onyx vom Herrnberg, was imported from Germany and her dam, Briska von Hellegraf Stamm, passed the Körung in Sweden (Korad), was a Swedish Obedience Champion (SL-Ch) and winner of numerous show titles.